Physiological and behavioral responses to many classes of stimuli are altered during aging. Best studied among these have been hormone and neurotransmitter signal transduction sequences. Age-related alterations in these processes have been grouped into receptor and postreceptor changes. 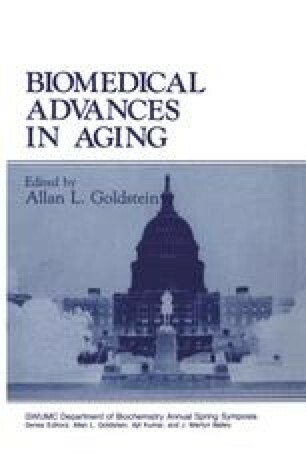 Our laboratory has focused on three systems that exhibit representative age-associated alterations in signal transduction mechanisms: (1) dopaminergic regulation of motor function, (2) estrogenic regulation of uterine anabolic function, and (3) α-adrenergic regulation of parotid secretory function (for review, see Roth, 1985).